The duplicate command allows you to create a new image that is an exact duplicate of your current image. The mode submenu provides several options that allow you to change the image color mode. RGB (Red/Green/Blue) is the default mode, and provides the highest quality images, each color with an intensity value of 0-255. It is simple to change RGB to other modes, but ultimately difficult — or impossible — to convert other modes back into RGB. Grayscale mode converts images to grayscale with 256 levels of gray, from 0 (black) to 255 (white). Indexed mode used a fixed number of colors (256 or less) and so reduces file size. The assign color profile command does exactly as it suggests — whatever that is! Color profiles are look-up tables that can translate color characteristic of a device to a device-independent color space. The convert color profile command does exactly as it suggests — whatever that is! The transform submenu provides options for flipping, rotating, and slicing. The flip commands allow you to flip an image horizontally (side-to-side) or vertically (top-to-bottom). The rotation commands can rotate an image 90 degrees clockwise or counterclockwise, as well as rotate it a full 180 degrees. The guillotine command slices an image up along the guides, and creates a new image with each piece. The canvas size command allows you to re-size the canvas, which is the visible area of the image; the image itself is not re-sized, and can still be modified, but not seen. 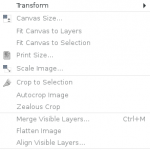 The fit canvas to layers command allows you to automatically re-size the canvas to show even the largest layer, making all areas of the image visible once again. The fit canvas to selection command re-sizes the canvas to fit your selection. The print size command opens a dialog from which you can change the dimensions and resolution of an image for when it is printed, all without changing the actual dimensions of an image. The scale image command allows you to re-size the image — contents,layers, canvas, and all. The crop to selection command removes all parts of the image outside of the selection to effectively crop the image. The autocrop image command searches the border of the active layer for the largest same-color area and crops that area off of the entire image (including all other layers). The zealous crop command uses a single solar color in the active layer as a guide to crop instances of that color from the image as best it can. The merge visible layers command merges all layers with the “eye” icon (in the layers dialog), meaning they are visible, into a single layer. The flatten image command merges all layers into one without transparency. The align visible layers command will — go ahead and guess! — align all layers with the “eye” icon (in the layers dialog) either vertically, horizontally, etc. Guides are reference lines that can be created as extensions to the ruler, displayed as lines over your image. The image menu guides submenu has a number of commands that allow you to work with guides. The new guide command opens up a dialog box from which you can specify the direction and position (in pixels) that the new guide should be placed in. The new guide by percent command opens up a dialog box from which you can specify the direction and position (by percent) that the new guide should be placed in. The new guides from selection command adds four new guides, one along each side of your selection. The remove all guides command… do I really need to say it? The configure grid command lets you set up the properties of the grid that can be displayed over your image as you work. The dialog allows you to configure line style, colors, spacing, and offset. The image properties command opens the window that shows properties for your image. You will see standard details such as pixel dimensions, print size, resolution, color space, file name/size/type, etc.